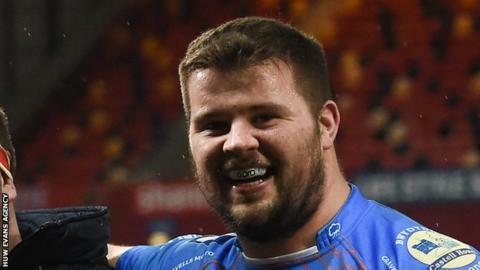 Dragons have signed Scarlets tight-head prop Nicky Thomas on loan until the end of January 2018 to cover injury to Brok Harris. Thomas, 23, joined Scarlets from Gloucester before the 2017-18 campaign began, then went on loan to Bristol. South African 29-year-old Harris' shoulder injury is expected to keep him out for four months. Dragons head coach Bernard Jackman said Thomas "is one of the best scrummaging tight heads around". Jackman added: "Our scrum has been a real strong point for us this season and we want to continue to dominate in this area and I feel Nicky has the attributes to do that." However, Thomas will not be available for Dragons against Newcastle in the European Challenge Cup at Rodney Parade on Friday.